Figure 16 The East Lomond seen from above Hanging Myre Farm. The summit is composed of a very late Carboniferous to early Permian olivine-dolerite volcanic plug, while the shoulder on the left comprises agglomerate. Walking distance 5 km of track and grassy hill walking. Purpose To examine (1) part of the great Midland Valley Quartz-dolerite Sill exposed over much of the East Lomond area, including contact phenomena at its base and top; (2) Lower Carboniferous sediments adjacent to the Sill; (3) the East Lomond volcanic neck with its agglomerate and olivine-dolerite plug, the latter forming the highest part of the hill; and (4) the view from the summit of the geology of much of Fife and on a clear day across to the Lothians to the south and to the Sidlaws and the Scottish Highlands to the north and west. Proceed by A91 to Cupar then south-west on A92 along the foot of the scarp formed by the Midland Valley Sill through Pitlessie and Kettlebridge to the roundabout at the junction with A914 and A912. Now follow A912 north-westwards for 1.5 km to the signposted road on the south-west leading to the picnic site on the East Lomond. This is a single-track but good road with passing places and there is ample room to turn the bus at the picnic site (2 km) and TV tower [NO 252 058]. Send the bus back to A912 and then through Falkland and up the unclassified road from Falkland to Leslie as far as the Craigmead car park [NO 227 063]. If a bus is not being used it is best to drive to the Craigmead car park direct and walk eastwards for 2 km, using the hill road, to the TV tower at the picnic site. From the hill road the appearance of the East Lomond is of a rounded summit with a marked shoulder on the western side. The summit is formed of olivine-dolerite and the shoulder of agglomerate. The path to the summit of the East Lomond runs west from the TV tower and first crosses a very poorly exposed small neck containing an olivine-dolerite plug and agglomerate, outcrops only being seen in ruts in the path and among the heather on either side. On the path, about 650 m from the TV tower, the margin of the main East Lomond neck is reached, but exposures here are poor. This neck and the basanite neck of the West Lomond are thought to cross-cut the Midland Valley Sill but the relationship cannot be proved on the ground. Cameron and Stephenson (1985, pp. 110,119) discussed the likely sequence of igneous activity in the Midland Valley and noted the respective age dates for such quartz-dolerite sills at about 295–290 My and of such basanites at 290–280My, i.e. the sills as late Westphalian to early Stephanian and the necks as a little younger, late Stephanian to early Permian. Continue up the path to 150 m beyond a stile in the wall, which crosses the path, until a lm high trigonometric station is seen 2 m south of the path. By walking a short distance south-west from the trig. station small outcrops of agglomerate can be seen, and display the soft and friable nature of the rock. The agglomerate is pale olive-grey in colour and contains fragments of very rotten lava up to 1.5 cm in diameter. One reasonably fresh fragment examined by Walker and Irving (1928, p. 6) proved to be of olivine-dolerite. Now examine the prominent crags between the trig. station and the top of the East Lomond. These are of olivine-dolerite showing irregular columnar jointing, described by Irving (1929) as radiating from the centre of the mass. Many exposures of this rock occur all round the top of the hill and some have yielded quartz xenocrysts (Walker and Irving 1928, p. 5). In hand specimen the rock is dark green to black in colour and olivine can usually be seen. Vesicles with green chlorite also occur and the rock is generally very fresh, a feature in marked contrast to the normally deeply weathered quartzdolerite of the sill, e.g. in Craigmead Quarry, Location 7. The spheroidal weathering so common in the quartz-dolerite is also absent. Many of the hills and peaks seen from the summit can be identified from the direction indicator. To the west and projecting 120 m above the very obvious feature formed by the Midland Valley Sill lies the West Lomond. This is a neck occupied mainly by a basanite plug and surrounded by sediments. To the south the ground falls away towards the synclinal Fife Coalfield, centring on Leven and including rocks of Upper Carboniferous (Westphalian) age belonging to the Coal Measures. This structure is continued on the south side of the Firth of Forth in the Lothian Coalfield, immediately to the east of the Pentland Hills. These hills comprise Lower Old Red Sandstone volcanic rocks brought into faulted contact with the coalfield by the large Pentland Fault. On a clear day the Carboniferous volcanic necks of Arthur's Seat and the Castle Rock in Edinburgh are visible as is the teschenite sill of the Salisbury Crags. In Fife, to the east notice the volcanic necks of Largo Law and Kellie Law. To the north-east the ground falls away to the Howe of Fife, underlain by almost horizontal Stratheden Group sediments which, along the south side of the Howe, pass up into Inverclyde Group and very thin Strathclyde Group rocks where they are protected by the Midland Valley Sill, which extends from the Lomond Hills almost to Cupar. North of the Howe and Stratheden the lavas of the Ochil Volcanic Formation of the Lower Old Red Sandstone form the North Fife Hills, a continuation of the Ochil Hills, and dip at about 20° SE under the horizontal Stratheden Group, approximately equivalent to the Upper Old Red Sandstone. Beyond these hills to the north lie the Sidlaw Hills, also composed of Ochil Volcanic Formation lavas, but this time dipping northwest on the other side of the Sidlaw Anticline. In the far distance many peaks of Highland Dalradian rocks stand up beyond the Highland Boundary Fault. During the late Devensian glaciation ice movements in the area were from west to east with the main Forth ice lying to the south of the Lomond Hills and east-flowing ice also moving down Stratheden. The Howe of Fife is covered by an extensive spread of fluvio-glacial sands and gravels which are exploited in the Ladybank–Collessie area. To the north, too, ice moved eastwards in the Carse of Gowrie between the Sidlaws and the North Fife Hills. 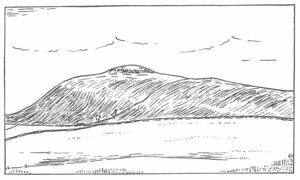 The summit of the East Lomond is the site of a hill fort with two encircling ramparts, best seen to the north-west of the summit, and of 'late first millenium BC – early first millenium AD' age (Walker and Ritchie 1987, p. 165). The direction indicator on the summit stands on a bronze-age cairn. Continue west and descend from the summit down the fairly steep slope of olivine-dolerite crags to reach the steep grassy slope on agglomerate. An E–W wall passing 180 m north of the summit extends for another 1.5 km to the west. Keep about 65 m south of this wall and follow it for 275 m from the foot of the steep agglomerate slope to the spring at Hume's Head where fossiliferous baked shales crop out. By following the stream that flows north out of the spring for 20 m, the top of the Midland Valley Quartz-dolerite Sill is reached. The shales must therefore lie only a few metres above the sill. A long line of old workings in the Charlestown Main Limestone can be followed SSW from the spring for 550 m to the East Lomond Quarry beside the old road leading westwards to Falklandhill Quarry. The limestone is exposed 225 m south of the spring and is recrystallised, buff weathering, partly fine grained and partly dolomitic. One hundred and ten metres further on recrystallised limestone is again exposed; the fossils in it have weathered out leaving moulds. The remaining old workings show only loose sandstone blocks and small exposures of baked shale. Old workings, some of them flooded, extend for some 200 m south of the road. One hundred and sixty metres to the south about 1.2 m of muddy limestone is exposed and contains corals, but is recrystallised. There is a Fife Ranger Service Industrial Heritage Trail in these old workings including a restored kiln at the southern end of the workings. If time permits the trail is well worth following giving an indication as it does of the economy involved. The shortage of limestone over much of Fife led to workings here at over 350 m above sea level in the Charlestown Main Limestone by a team believed to be of six men, two boring and blasting, one carting, two breaking and loading the kiln and one drawing the lime and supplying the customers. The sill is chilled to a fine-grained, dense, black, basaltic rock for a few millimetres from the contact. The contact is transgressive and the horizontally bedded sandstone is baked to a quartzite for a short distance below the sill. 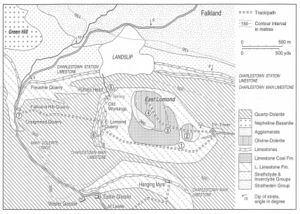 Walker (1958, p. 113) found evidence in this quarry for very slight mobilisation or rheomorphism of the Carboniferous sediments at the base of the sill. The mobilised rock, which is believed to have originated in shalier laminae within the sandstone, lies between the sill and the sandstone and is 1 mm to 3 mm thick. Under the microscope Walker described it as invading the sandstone transgressively, but not penetrating the edge of the sill. This phenomenon is not visible in the field on account of its small scale. Falklandhill Quarry, on the northern side of the hill road, displays the same major features but is more deeply weathered. Two hundred metres north along the Falkland road is a now overgrown sandstone quarry, at one time worked for building stone. Opposite a gate in the roadside wall and 50 m further downhill is Freuchie Quarry. In it shales and sandstone underlying the Charlestown Station Limestone are exposed. These too lie beneath the Midland Valley Sill. The limestone itself is poorly exposed and like the shales is not very fossiliferous. 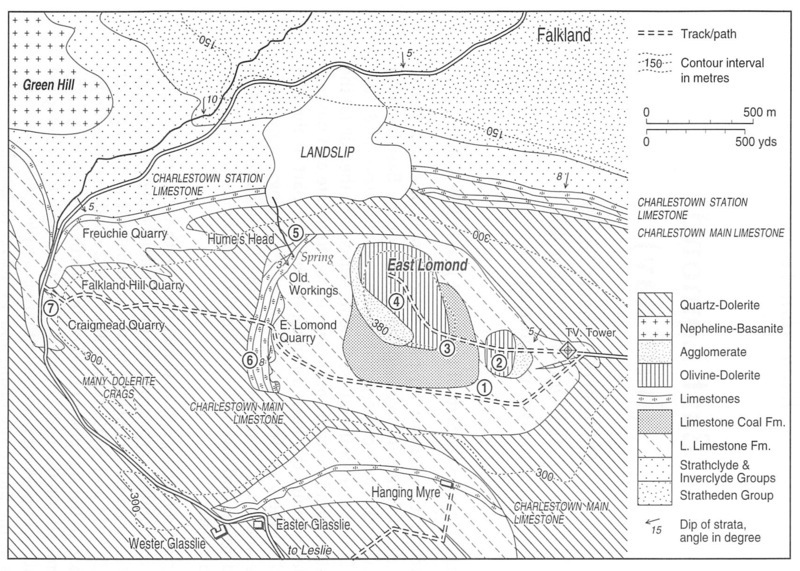 Forsyth and Chisholm (1977, p. 60) correlated the limestone with the Hurlet Limestone which marks the base of the Lower Limestone Formation. Rejoin the bus at Craigmead car park and return to St Andrews by retracing the outward route. CAMERON, I. B. and STEPHENSON, D., 1985. The Midland Valley of Scotland. Br. Reg. Geol, (3rd Ed.) HMSO. HEDDLE, M. F., 1901. The mineralogy of Scotland. David Douglas, Edinburgh. IRVING, J., 1929. The Carboniferous igneous intrusions of northeastern Fifeshire. Unpublished Ph.D. thesis, University of St Andrews. WALKER, B. and RITCHIE, J., 1987. Exploring Scotland's Heritage, Fife and Tayside. Royal Commission on the ancient and historical monuments of Scotland. HMSO. WALKER, F., 1958. Dolerite-sandstone contact phenomena on the East Lomond, Fife. Trans. Edinb. Geol. Soc. 17, 113–16. WALKER, F., and IRVING, J., 1928. The igneous intrusions between St Andrews and Loch Leven. Trans. Roy. Soc. Edinb. 56, 1–17. This page was last modified on 23 February 2019, at 14:28.